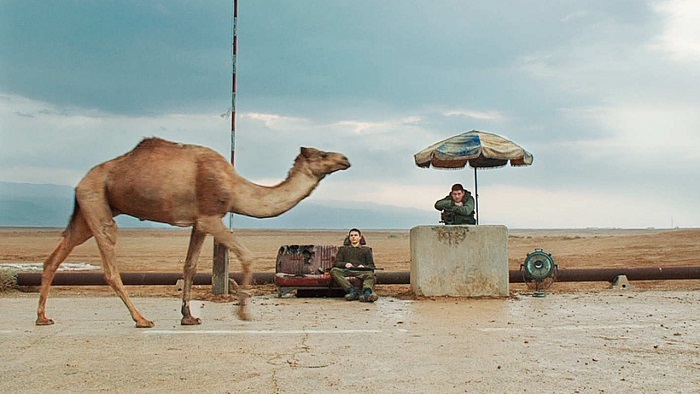 PHOTO: Foxtrot (Israel) screens June 14. It’s summer in Portland, and that can only mean one thing – the Portland Jewish Film Festival is back. Brought to us by the Institute for Judaic Studies in collaboration with the Northwest Film Center, the festival is gearing up for its 26th annual incarnation with an eclectic lineup of heralded films from all over the world. “We produce it and program it, and our partner, the Institute for Judaic Studies, is the real funder for the event,” says Bill Foster, with the Northwest Film Center. “They’re the lead sponsor of the whole thing and the community liaison.” The institute acts as the beacon, attracting an audience from all over the Pacific Northwest to see the work of the film center. All films will be screened at the Whitsell Auditorium at the Portland Art Museum. The festival kicks off on Sunday, June 10, with the 2017 Israeli crime comedy “Maktub,” a caustic and politically incorrect look at a pair of Israeli mobsters who find spirituality after surviving a suicide bombing. The festival doesn’t have a connecting theme beyond the Judaism of the filmmakers and/or subject matter of the films. This is because, as the programmers are not necessarily Jewish, the NWFC members didn’t presume to judge the field of films from the Jewish perspective. Their goal is to show a broad sampling of subjects that might appeal to a group of people of varying backgrounds wanting to see a glimpse of the Jewish world. Among the highlights of this year is “An Act of Defiance” (2017), a South African and Dutch co-production that tells the story of the 1963 farmhouse raid by police in Rivonia, a neighborhood of Johannesburg, South Africa. The raid netted Nelson Mandela and 10 other South African revolutionaries, including five Jewish contributors to the cause of toppling apartheid. Among them were the fascinating history shapers including famed artist Arthur Goldreich, who escaped police custody, and Denis Goldberg, one of only two surviving members of the group and still a player in South African politics. Also on the docket is the brilliant character study “Foxtrot” (2017) starring budding international star Lior Ashkenazi (long the leading male star of Israeli cinema). A German, French, Swiss and Israeli co-production, the film follows the breakdown of a family in the wake of troubling news from the military outpost where their son is stationed with the IDF. There are 15 other feature films in the schedule including foreign language and English comedies, dramas and documentaries, plus an array of short films, which will precede some of the features. There’s even a silent film in the lineup, “This Ancient Law” (1923), and an animated feature for kids, “The Legend of King Solomon” (2017), a Hungarian/Israeli coproduction that tells the biblical story in a way families can enjoy together. Sylvia Frankel is on the board of directors of the Institute for Jewish Studies. She spoke to us about the importance of the festival and its history. The festival started in 1991 as just a weekend of films on the Oregon Coast, organized by Rabbi Joshua Stampfer, the much beloved rabbi of Neveh Shalom in Portland. The festival has expanded over the intervening quarter century to become an event that draws more than 2,000 attendees over the course of two weeks of films. “I’ve been told that unless you have more than 10 films within a short period, you can’t call it a festival,” says Sylvia. The Portland Jewish Film Festival is definitely a confirmed festival and will look to kick off another quarter century of reaching a diverse community with a broad selection of films about Judaism this summer.